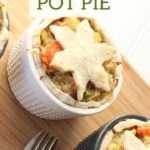 A delicious Turkey Pot Pie with a pretty, rustic flair! Comfort food at its best. Cook potatoes, carrots and peas. Drain. In a sauce pan, cook onion in butter until tender. Stir in flour, salt, sage and pepper. Add water, milk and chicken bouillon all at once. Cook and stir until thickened and bubbly. Cook and stir 1 to 2 minutes more. Stir in drained vegetables, chicken, and parsley; heat until bubbly and add a teaspoon of lemon. Turn chicken mixture into a pie shell or ramekin lined with pastry, cover with top pastry or a cutout. Bake @ 450 for 10 to 12 minutes or until crust is golden brown.